Former Russian security officer and acting MP Andrey Lugovoy has told the press that he would no longer participate in the investigation of Aleksandr Litvinenko’s polonium poisoning in London, as he had lost faith in the British justice. “I have come to the conclusion that the British authorities will not give me an opportunity to prove my innocence and that I will not be able to find justice in Great Britain. I have definitely lost my faith in the possibility of an unbiased investigation of this case in Great Britain. I have to state that I am withdrawing from the coroner’s investigation and will no longer participate in it,” the Interfax news agency quoted Lugovoy as saying. Lugovoy also said he possessed investigative documents which he called “a politicized delirium”. He refused to disclose the details saying the ongoing inquiry is secret. According to the politician, a possible conclusion from the police report on Litvinenko’s death was that “the polonium traces do not lead from Moscow to London, but lead from London to Moscow”, adding that in his view the true goal behind the murder was “to blame Russia for Litvinenko’s death and accuse it of state terrorism using radioactive substances”. UK investigators hold Lugovoy as the main suspect in the murder of Aleksandr Litvinenko, a former FSB agent who fled to the UK in 2000 and died in 2006 of acute poisoning with the rare radioactive element polonium-210. Lugovoy and his business partner Dmitry Kovtun met Litvinenko in London not long before his death. British police said they considered Lugovoy as a suspect in the case and summoned him for questioning. Lugovoi was in Russia when the summons was issued and said that he would not return, but was ready to answer any questions in Moscow. The investigators requested Logovoy's extradition from Russian authorities,but it was refused as extraditions for trial in a foreign country are against the Russian Constitution. 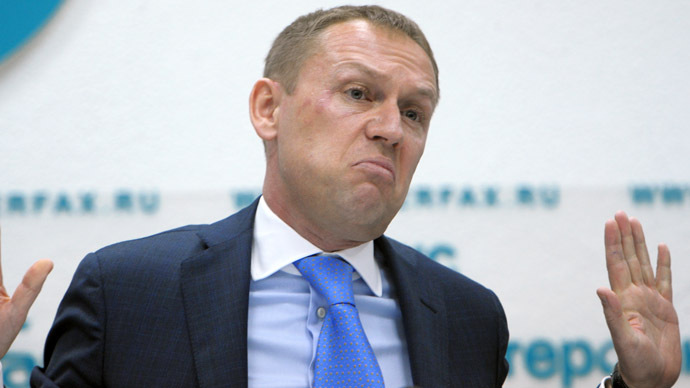 After the poisoning scandal Lugovoy was elected to the Russian State Duma and he now enjoys parliamentary immunity. The case led to a serious deterioration in Russia-UK relations. The inquest hearings into Litvinenko’s death are scheduled for May. In the most recent development the British coroner ordered the material in the case should not be disclosed to the press. This caused a sharp reaction and the suggestion of political influence. The lawyer representing Litvinenko’s widow claim the late agent was working for British intelligence and helped to investigate Russian mafia cases. After this announcement Russia’s top law enforcement body – the Investigative Committee – said that they were ready to participate in the process as an interested party.